Yarn in one main shade and several leftovers for stripes and mandala. I used Catona by Scheepjes in shades 113 (main color – 13g), 246, 397 and 399. Catona is available in balls of 25g and 50g and in a wide variety of shades. Please, read my review about this yarn HERE. You can choose and purchase your shades via Scheepjes local shops (NL), Deramores* or Wool Warehouse* (both retailers ship yarn internationally) and Paradise Fibers* (US). You can create your own cozy in any size. Gauge is not critical for this design. But I would recommend to crochet with tight stitches. 1. Mobil cozy is worked in one continuous spiral, so do not join rounds. 2. Use a marker to make it easier to find beginning of each round. Insert a piece of yarn approx. 20 cm (8 inches) long into the top of the last stitch of the first round and move it to the last stitch of each new round as crocheting progresses. 3. Change colour on the last yarn-over of the last sc of the relevant row. 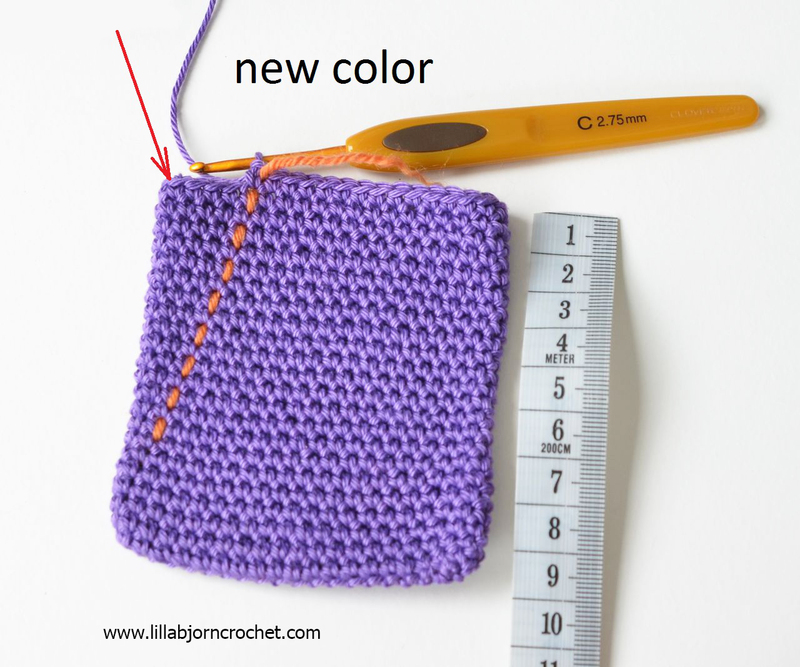 You can make colur changes invisible if you use THIS wonderful crochet tip by Needle Noodle. 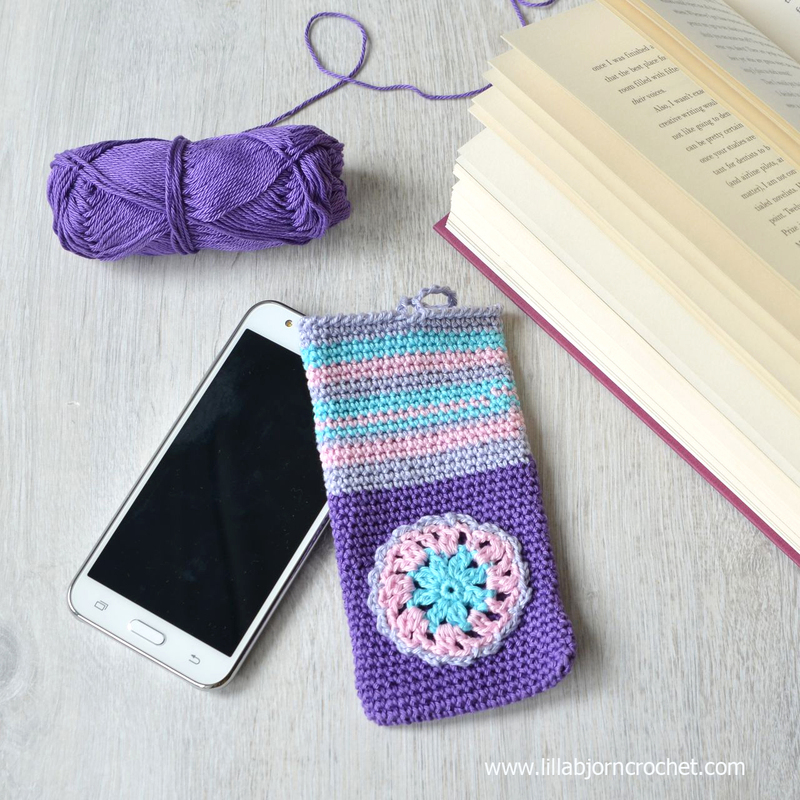 Before you start crocheting this cozy, please, carefully measure your mobile phone and decide how many stripes you would like to make and which part will be made in one color. 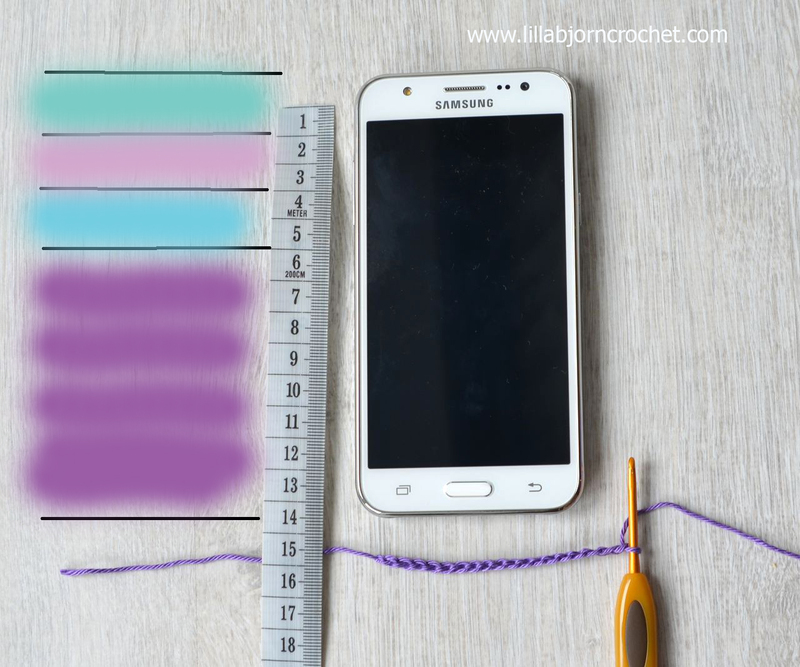 My friend’s phone is 14 cm high, and I decided to make it 9 cm in one main color and then add colorful stripes on top. I also decided to decorate it with a small crocheted mandala. But if you are not fond of this décor, you can make the whole cozy in one shade, or completely cover it with stripes (and use up your leftovers). 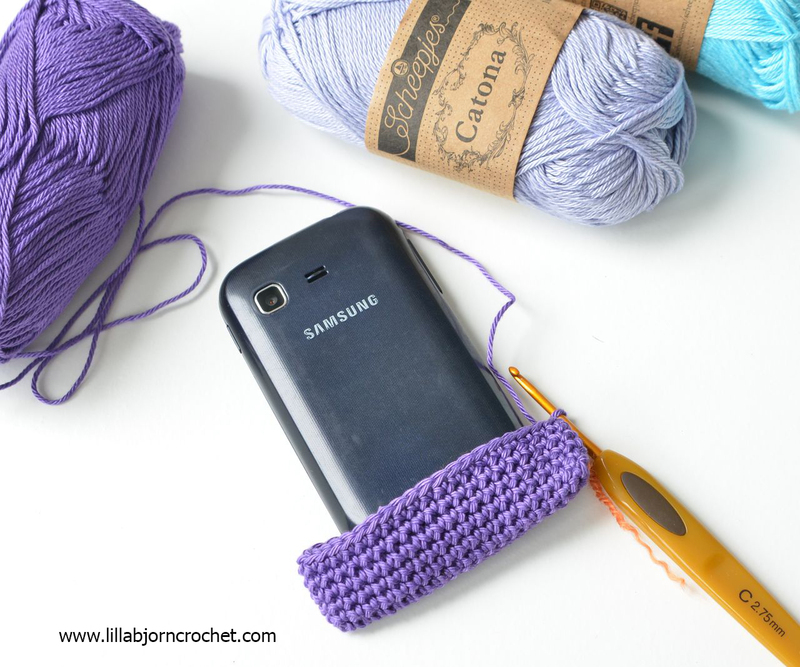 To begin make slip knot and make enough chain stitches to cover your phone’s width. You might try different number of chains – to make your cozy not too wide and not too narrow. Row 1. Beginning in 2nd ch from the hook make sc in every ch and 3 sc in last ch. Then turn your work and using other half of the base chain, continue making sc in every ch and 2sc in the last ch (where 1st sc of this rnd was made). If you are not sure how to begin – please check 1st round for Bloom Bathroom Organizer HERE. Row 2 and next rows will be crocheted in one continuous spiral (don’t forget to insert marker in the last st of the rnd and move it as you progress). When you reach the desired height you can add several colorful stripes. If you intend to repeat stripes in one color several times, don’t cut the yarn after each of them. You can use it again when you need to make another stripe. 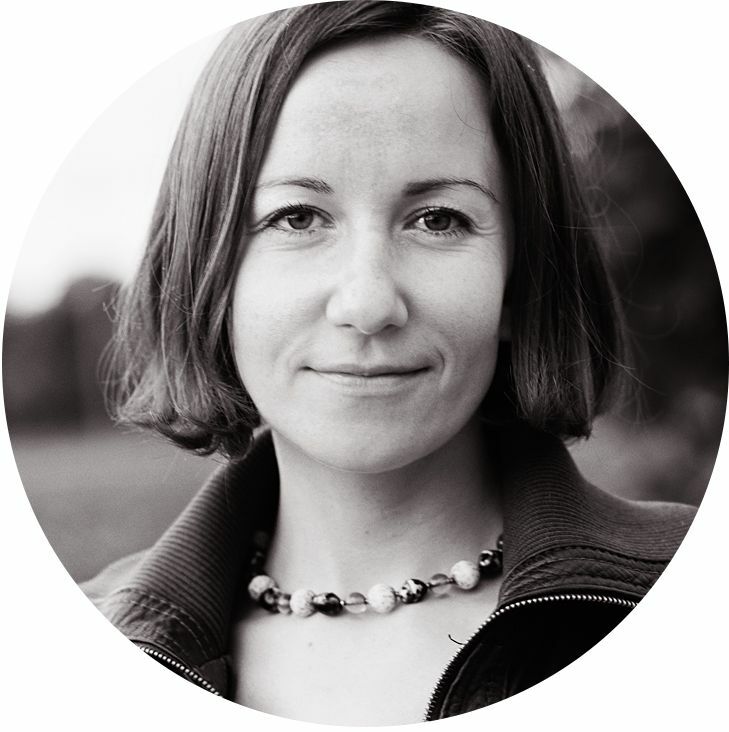 Because you work in spiral, the beginning of each new rnd will be twisting a bit. 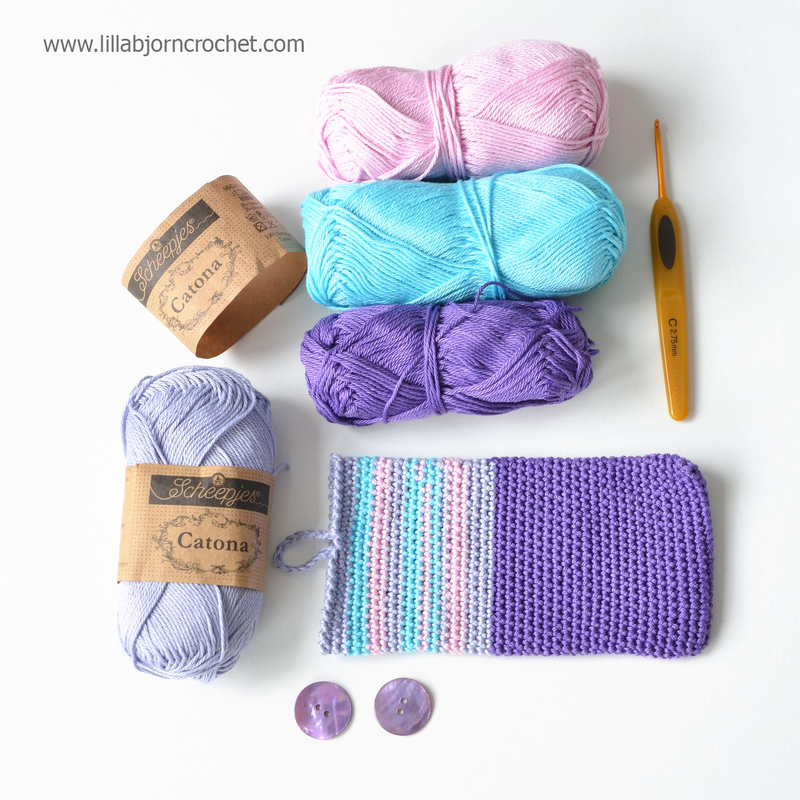 So before joining new color for a stripe, you may want to crochet to the side, and then attach new yarn. Again don’t forget to mark the last st of each round so that your colorful stripes line up neat. When you reach the desired height of your cozy – make a loop for a button clasp. Continue crocheting till the center of one side, make as many chain stitches as needed (to fit your button well), make sc in next st and continue with sc till the end of the round. When you come to the end of this rnd, crochet back with reverse sc (or “crab stitch”). When you reach the loop continue crocheting in front the loop around the cozy’s top till you come to the beginning of the rnd. Finish with sl st, cut yarn and weave all yarn tails in. Crochet a mandala using THIS pattern (only front part, without the bottom). After last rnd cut the yarn leaving approx. 40cm (15”) tail and sew mandala onto cozy using this yarn tail and a needle. Sew the button on the back (adjust its position for the loop). Congratulations! 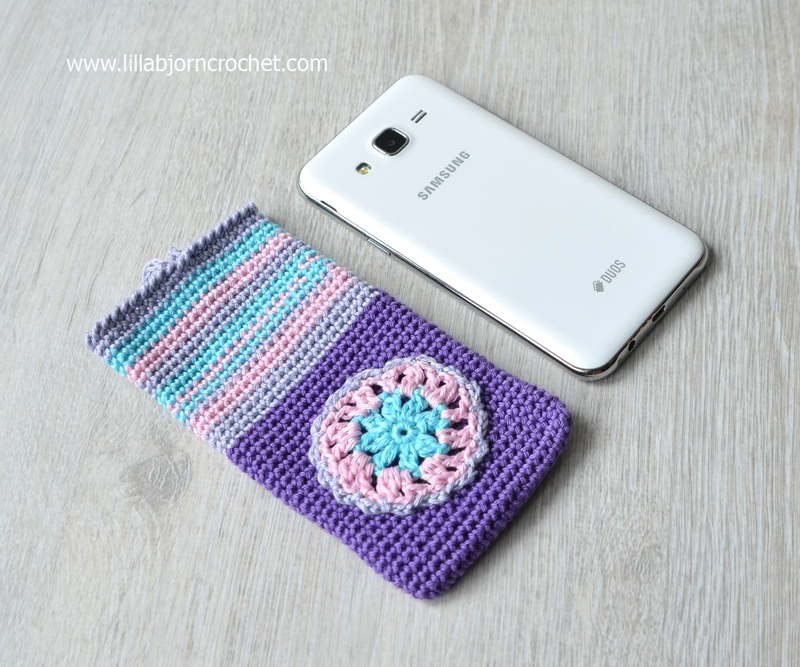 A new cozy for your mobile phone is now finished! If you would like to crochet a cord for this cozy, please, check a wonderful tutorial by Felted Button HERE. Congratulations on 1 million views! I really enjoy your projects, patterns, and pictures. I have just found your blog after joining the Last Dance on the Beach CAL and love it! Thanks for this lovely pattern & congrats on your 1 millionth view!